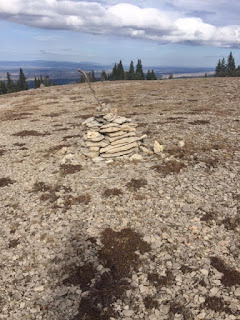 There are precious few days left of trail running season here in Montana. Soon the snow will fly and cover all my favorite places. I'm definitely not in to winter. 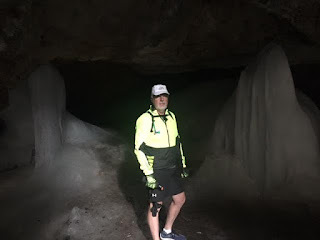 I'll run even in snowy conditions, but most mountain trails will not be easy to get to and the snow will be too deep to do anything without skis or snowshoes. 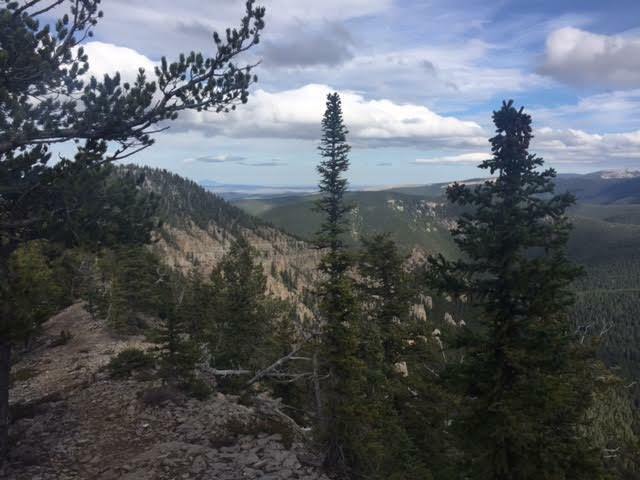 With next weekend slated for our Yellowstone ride, we knew we better get out and enjoy the beautiful weather while we still have it. 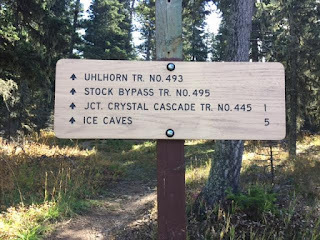 On Mother's Day weekend we drove the 2 hours to get to this trail head only to discover that the road was closed 7 miles out from it. We took this opportunity to give it another shot. The route we took was a 12 mile loop that included the little excursion off the main trail to get to the ice cave. This would be a perfect training trail for The Rut as it covered many of the types of terrain I encountered during that race. 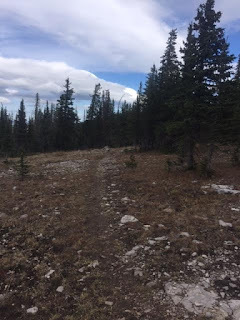 The entire loop was single track with varying levels of difficulty. It started out pretty easy... it didn't stay that way for long. 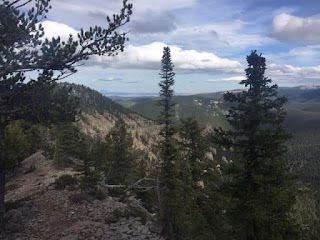 In the first three miles, we climbed over 2,000 feet in elevation. There were several scree fields - this one was quite steep though the picture doesn't do it justice. There were a few switchbacks on this section. I thought it would never end! It was painful. Along the top, the views were amazing. We worked our way around that entire bowl! 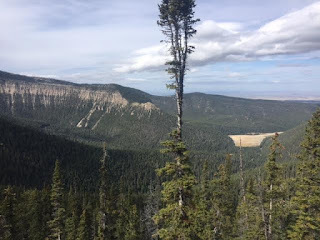 It's hard to believe that the route was only 12.5 miles when you look at how far we still had to go from this vantage point and we were already 3 miles in. We never saw another soul all day. It was a little chilly and the weather looked a little threatening, so maybe only the crazies were out. 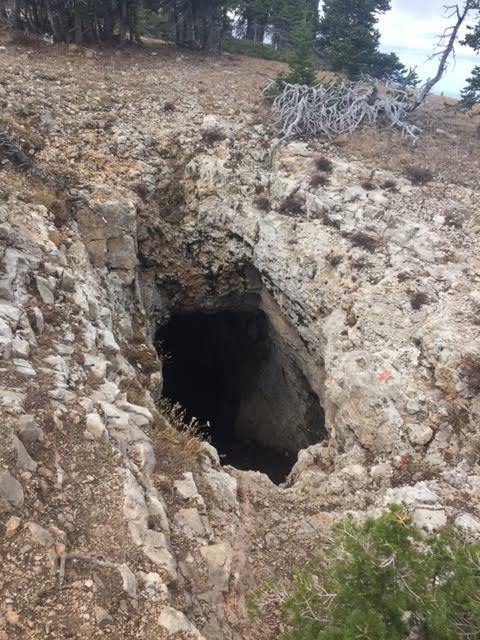 The Devil's Chute cave is deeeeeeeep. Again my picture can't do it justice, and neither one of us was crazy enough to get down in it for a better shot! I have no idea where this came out but I can just imagine it being a slide that opens out the cliff side of the mountain. 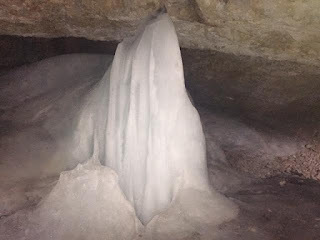 But the Ice Cave was what we went for anyway. 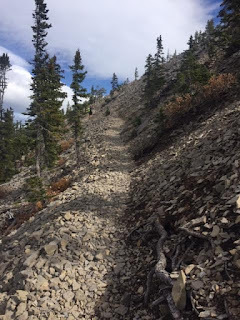 The side trail to get to it was very technical, steep and covered in loose scree. It was an adventure, but as you can see.... 100% worth it. How cool are these ice formations? And how random that they are down in this little cave on the side of a mountain? I think I look like a goof in this picture, which is what makes it totally post-worthy! These two pictures give you an idea how big the formations really are. 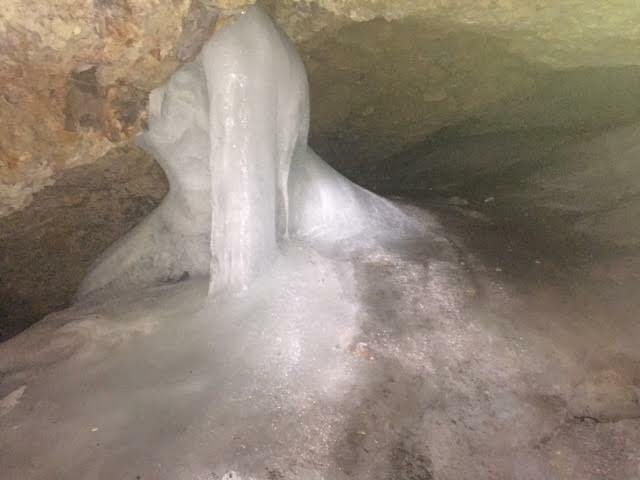 The bottom of the cave is also filled with ice and the water is still dripping in to the cave from the rocks. I have no idea where the water is coming from. 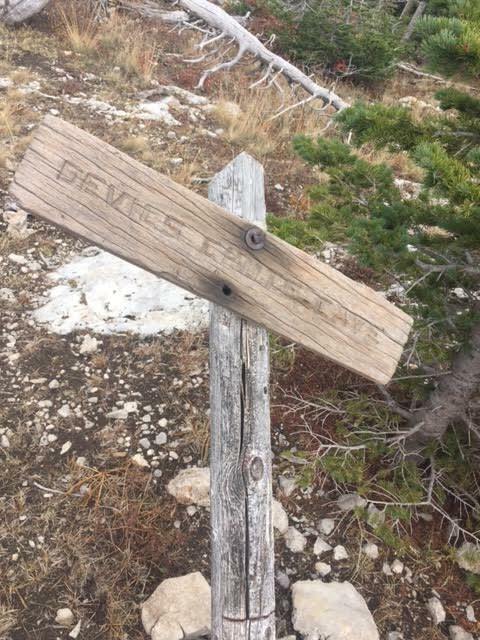 We hiked the trail above it and there isn't a body of water or a glacier of any type. Outside of the Ice Cave and back on to the main trail. Do you see a trail? I don't. 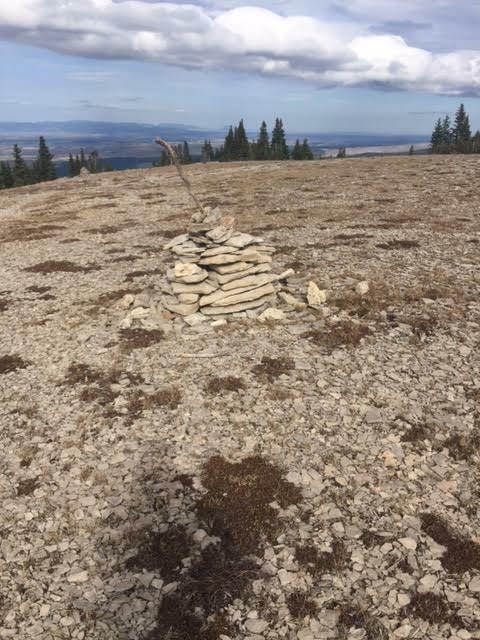 But there were cairns all along the area that didn't have a well defined trail. Thank you to whoever was responsible for that! This is my favorite part of the trail to run! It's along the ridge line of the mountain. 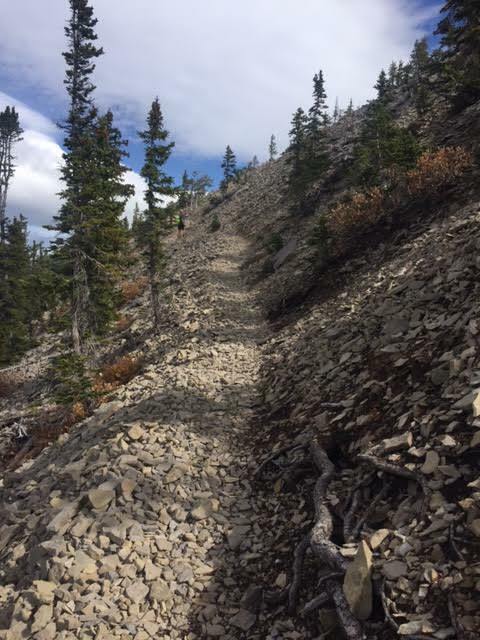 The trail from this point on is incredibly runnable. The ridge lends to the most gorgeous views. 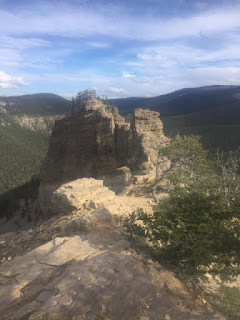 Grandview Point - one of the highlights along our journey. I didn't take any more pictures on the way down. 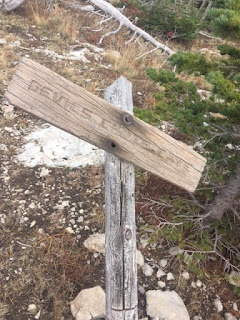 Overall the elevation gain (and loss) was 2,704 feet. Most of the gain was in the first quarter of the route. The second half of the day was a nice, gradual, downhill run. 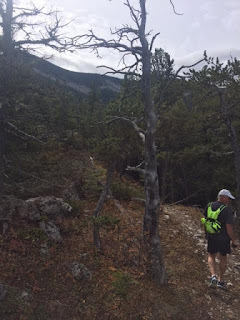 The trail was mostly easy single track. Loved. It. We did get a tiny bit lost in the last mile. Thankfully, Mitch has a pretty good sense of direction and we found our way back on track. For a moment it was scary though because it was getting dark quickly even though it was only 4:30. Why was it dark that early? Because there was a storm rolling in! We got back in to the truck after spending five hours hiking, sight-seeing and running. Within five minutes of leaving the trail head it started to storm. Talk about great timing!! It was such a fun day and I'm glad we went. 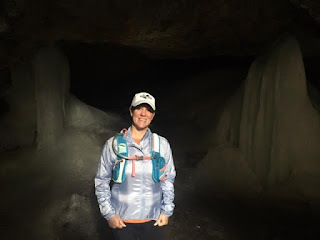 If we're lucky we might get another adventure in before foul weather sets in, but if we don't I feel like we ended trail running season on a great note. 1. Sleeping with the window open, but using the electric blanket. 2. Drinking hot tea (or any hot drinks for that matter) and enjoying it. 4. Cool weather to run in. 5. Leaves. Leaves are the BEST! Don't they just smell amazing in the fall? 6. Rain. Today it rained ALL DAY and I was happy. 7. Halloween and all the fun movies that come with it. I'm not talking horror movies... I like scary tales and fun Halloween stories. Think: Sleepy Hollow, Practical Magic and Hocus Pocus. 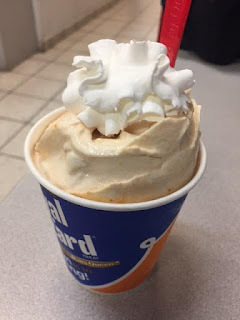 The Dairy Queen Pumpkin Pie Blizzard!!!! I have to go at least once every October for my Pumpkin Pie Blizzard. I've already been twice this year. What is the coolest thing you've gone out of your way to see on a run? Pumpkin Spice everything? Yay or nay?